Many anime feature magic of some kind, however in most cases the technical side of casting spells isn't really covered to any degree, and while there are shows that do give some insight into this side of "magic", the majority only really give cursory information. There are, however, some shows that do cover the technical side fairly well, and they manage to incorporate this aspect of "magic" into the story in a way that gives the show more depth than it would otherwise have had (great examples of this are Mushishi, Mokke, Rental Magicka, Ghost Hunt and Ghost Hound). Unfortunately, Yokuwakaru Gendaimahou doesn't fall into that category. Based on a series of light novels by Sakurazaka Hiroshi, the original 2002 book won the Super Dash Novel Rookie of the Year Award under the name "Mahou Tsukai no Netto", however this was changed in December 2003 to its current title. The story was first adapted for manga in August 2008, with an anime adaptation released in July 2009, just a few months after the release of the sixth novel in the series. The story is, ostensibly, about magic and the rivalry between ancient and modern practices, and the show begins with Ichinose Yumiko Christina and Morishita Koyomi battling a dead magician called Gilbartes. After that things get a little confusing. One of the problems with this series is that although it had a great idea, the execution leaves a lot to be desired. The plot starts of at a pretty good pace, and the immediate action grabs the viewers attention well, however the story quickly becomes confused as the attention shifts from action to introduction after the OP. After that the show seems to lose its drive and the plot begins its stop-start progress through the series. Another issue with the story is that it is fairly "wishy-washy" when it comes to dramatic development. There's little that happens in the story, barring the beginning of the first episode, that can truly grip the audiences attention without feeling forced, and while there are some nice ideas introduced over the course of the series (e.g. modern magic using computers, mageslayers, etc), these simply aren't enough to offset the vagueness of the plot. It's not until the end of the series that the story actually starts making sense, however the viewer will have to watch a number of mediocre episodes to get to that point. As far as the design goes, Yokuwakaru Gendaimahou is pretty stereotypical in its approach, which is truly a shame as this is one of the main reasons why the show is difficult to take seriously. The settings have a generic quality about them which doesn't help, however the biggest problem is that the characters have been designed with "moe" in mind. That said, the show has some pretty fair animation and visual effects, and I particularly liked the way the magical "codes" were represented. One area where this series did suffer was in the sound department as, once again, the producers were afflicted with the generic bug. The music is pretty much what one would expect from a show that has been infused with moe, with a typical J-Pop OP and ED, and thematic music that tries a bit too hard to enhance the mood of the scene. As for the voice acting, well, to say that Yokuwakaur Gendaimahou is typical would be an understatement. While the seiyuu all have a great deal of experience they aren't really given a chance to show their talent, something which I consider a waste as aside from Kotobuki Minako (who plays the role of Kaho), the rest of the cast have all shown their true skill in other shows. While it's true that the design doesn't help the series, the problem is further compounded by the lacklustre characters. The biggest flaw in this series is that there is almost no attention given to the development of any of the characters and, while some shows can get away with this, Yokuwakaru Gendaimahou is sadly not one of them. The lack of any real development leaves the characters as nothing more than moe puppets that have no real depth to them. There isn't actually any character who really stands out either, something which becomes more notceable as the series progresses. That said, while it's true that there isn't any depth to the characters, I was surprised to find that most of them didn't annoy me either, however that may be because the premise of the series allows for a degree of flexibility where roles are concerned. Now I will admit that I like the technical side of magic, the whys and wherefores of how things are done, and while Yokuwakaru Gendaimahou gives a little bit of insight into how maigc works in the story, there simply isn't enough detail to make either the ancient or modern systems anything more than plot devices, something which may explain why the protagonists only seem to know one combat spell. Granted the premise is interesting enough, but if you're after something with a bit more depth and substance to its inner workings, then this series should be way down on your list. While the show does have many flaws, the main one being how generic it is, there are some entertaining moments. However, these moments are not enough to hold the story together, and in some cases only add to the confusion of the plot. It's a sad fact, but Yokuwakaru Gendaimahou could have been so much better than it actually is. But what else can one expect from a series that is more about mass appeal than substance and content? STORY 6/10- Let me start by saying that this anime had a GREAT concept and probably the most unique idea I've ever come across. I was fully captivated by the theme of "modern day" magic. Now where this category slips is in the actual content of the story. With such a GREAT concept, I would've liked to have experienced a more deep and serious unfolding of events. The story line in actuality is rather lighthearted which some people may actually enjoy more, though in my opinion was in danger of being almost boring. Really depends on your tastes, the "6" being my sole opinion. Great last couple episodes though. ART 8/10- I give the OP credits a 10/10, absolutely amazing. The characters were drawn well, though I'd say the art throughout the anime was somewhat simple not necessarily in a bad way. The magic effects were great, especially that "digital" looking effect. The fight scenes were pretty well animated, but I don't think it can compete with all the other great fight scene anime out there. SOUND 8/10- Once again I give the OP credits a 10/10. In fact, lets just say that the OP credits of this anime is by far one of it's greatest assets (and I don't mean to downplay the other aspects of this anime at all). The voice acting was great, all voices very fitting to their characters (my favorite being Kaho). CHARACTER 7/10- The character design was good, if not rather typical. Our heroine was quite charming, perhaps a little simple minded (maybe even kinda dumb) but that's all part of her charm. 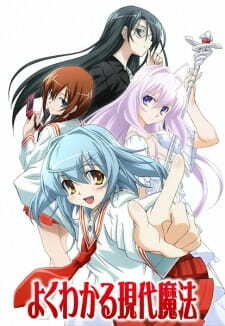 Then you've got your well mannered tsundere, your sensei, and your quiet friend that's really intelligent (Kaho! I'm a sucker for freckles XD) The bad guys were somewhat boring in my opinion but they played their part. ENJOYMENT 7/10- I always look forward to something unique, as that can be somewhat rare nowadays. It was easy to stick this one through to the end. If you're looking for something unique, then check this one out. I recommend it! Not so much a review, but I had to get this off of my chest. In a world where magic is shown to be capable of so much, why does the only offensive spell consist of summoning a sword and launching it at one's foe? If I ever hear Turn to Sword, My Code again, it will be too soon. An opportunity to explore the suffusion of technology and its interaction with the spells of old entirely wasted on feeble character interaction and rampant misdirection, either of the characters or of the viewer by unnecessary closeups or unwelcome antics. There are cute moments, but vast gaps of annoyance lie between. I suppose I should have expected as much, but truly, the best word for it is waste. The basic premise of Yoku Wakaru Gendai Mahou is Modern Magic, which uses codes to produce spells instead of using the traditional incantations and scrolls, etc. This is somewhat a fresh spin to other magical girl shows, and is refreshing. Of course, there are also magicians in the show that use the olden version of magic, which requires them to recite an incantation. The story itself was very plain, with just the basic evil guy trying to conquer the world. Although it was somewhat a new spin on this genre, the hopeless story plot just brought the mark down terribly. The programming language of "Modern Magic"